As long as robotic bellhops are one day destined to carry our luggage and show us to our hotel rooms, we might as well provide them with the agility to wiggle safely through crowds of people. That's the thinking of Hitachi's robotic engineers, who have been working with researchers from Tsukuba University to upgrade their EMIEW (Excellent Mobility and Interactive Existence as Workmate) robot's crowd navigation abilities. To coexist with humans in the real world, robots need to be able to respond to a host of changes that constantly occur in the course of everyday life. This includes the ability to reach a destination without colliding into stationary or moving obstacles (such as fellow pedestrians) -- an ability that requires autonomous robots to "see" the people around them and measure their speed and direction. 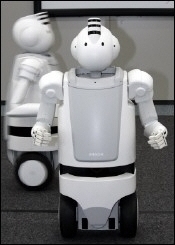 When Hitachi originally developed EMIEW in 2005 as part of the Project for the Practical Application of Next-Generation Robots organized by NEDO (New Energy and Industrial Development Organization), the aim was to design a robot capable of coexisting with humans while providing support in real-world situations. These latest upgrades, which build upon Hitachi's original aim, include outfitting EMIEW with a reliable human motion detection system, which relies on lasers and distance sensors that constantly (40 times per second) measure the distance to the legs and feet of the surrounding people. Hitachi also revamped the operation patterns of EMIEW's mobility control technology. The new technology enables EMIEW to interpret the data about the position and speed of the people nearby. From this data, the robot calculates an imaginary circle of a fixed radius around each person and selects a course based on those calculations. In addition, Hitachi programmed EMIEW to search for new obstacles and correct its course every half second (roughly the average amount of time between a person's footsteps). This process enables EMIEW to respond when a nearby person changes speed or direction, or when a new person moves into the robot's path. To check EMIEW's newfound ability to avoid obstacles, Hitachi put the robot to the test on an 8-meter long course along with 4 people walking at normal speeds of 4.3 kph (2.6 mph). The robot successfully completed the trial runs at a brisk 2.9 kph (1.8 mph). While these results suggest EMIEW may be ready for a job plying the hallways of a spacious luxury hotel, the day EMIEW totes your suitcases through Shibuya station appears to be a long way off. Hitachi plans to unveil this new technology on September 14 at the 24th Annual Conference of the Robotics Society of Japan (RSJ) at Okayama University (Tsushima Campus). In addition, demonstrations of the upgraded EMIEW will be held beginning October 23, 2006 at the FISITA 2006 World Automotive Congress, an international automotive technology expo being held at Pacifico Yokohama. EMIEW -- Excellent Mobility and Interactive Existence as Workmate -- an acronym worthy of an award. I would love to see it navigate Shinjuku Station. I can barely make it through the West Exit concourse without slamming into a dozen salarymen!